Karan Johar’s big project period drama Kalank released today. After much anticipation and excitement rounded the internet, the multi starrer made its way to the theatres with a bang. The ensemble cast of Varun Dhawan, Alia Bhatt, Aditya Roy Kapur, Sonakshi Sinha, Madhuri Dixit and Sanjay Dutt was the talk of the town, ever since the movie went to the floors. 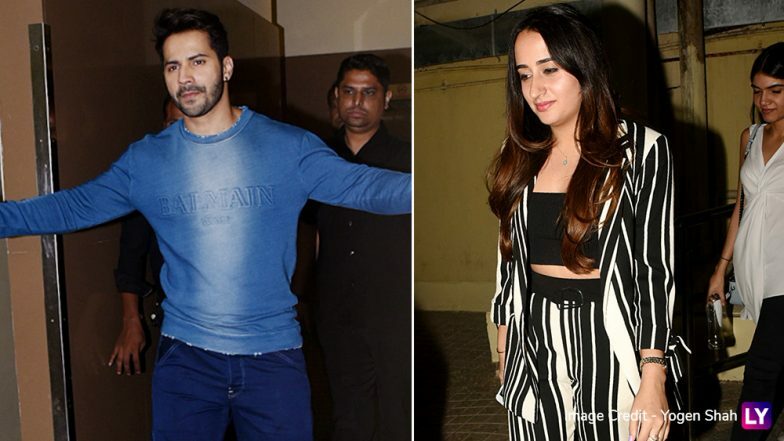 The movie screening for the Bollywood celebrities was hosted yesterday and the Kalank star Varun made an appearance with girlfriend Natasha Dalal. Kalank: Janhvi Kapoor, Ananya Panday, Tara Sutaria and Others Attend the Screening of Alia Bhatt and Varun Dhawan's Period Drama - View Pics. Varun and Natasha were spotted together post the screening. The pretty smile glued to Natasha’s face is proof that the movie worked its charm on her. Other celebrities from the showbiz world who attended the screening included Janhvi Kapoor, Neha Dhupia, Tara Sutaria, Ananya Panday, Kriti Sanon, Khushi Kapoor and others. Kalank is Karan Johar’s most ambitious project. Conceptualised by his father Yash Johar, the movie was brought to life by Karan. The movie is based on a love story in the pre-partition era. Helmed by Abhishek Verman, Kalank is bankrolled by Dharma Productions.